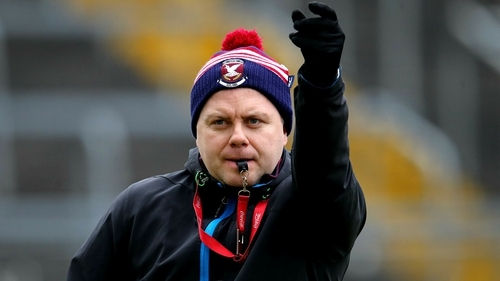 Cavan boss Mickey Graham acknowledges his team's survival in Division 1 of the Allianz Football League is hanging by a thread but that doesn't mean they won't embrace the visit of Dublin to Kingspan Breffni Park this Sunday. Graham's men have one win from six in the top division - an excellent nine-point defeat of Roscommonm - but sit bottom of the table heading into the last round of fixtures. They will have to beat the Dubs, hope that Roscommon and Kerry draw, Monaghan lose to Mayo and then require a good enough scoring difference lift them out of the bottom two. It's a tall order, but Graham is relishing the chance to have a go against Jim Gavin's five-in-a-row chasers. "We need a lot of things to go right," he told RTÉ Sport's Brian Carthy. "First of all, we'll just concentrate on the Dublin game. Having the All-Ireland champions visiting Kingspan Breffni Park in itself is a huge task. We'nothing to lose at this stage. We're just going to go out and express ourselves. "Maybe you can get a result and maybe other things go your way but you're asking for an awful lot to be honest. "Cavan has a huge tradition. The people will come out to see the quality Dublin will bring but they'll also be hoping Cavan can put on a performance and give them something to cheer about. "You're talking about one of the greatest teams of all time. They're only starting their pre-season training where a lot of teams are six months into it at this stage. You'll see a different Dublin team in the Championship." It's been a challenging spring for Cavan. They earned promotion from Division 2 thanks to a thrilling win against Tipperary a year ago and Graham then masterminded Mullinaghta's fairytale Leinster Club Championship success. He insists, however, that those feats with the Longford outfit did not impact his preparation for Cavan's league campaign. "It wasn't relevant at all. We'd a great understanding between County Cavan and Mullinalaghta. We were able to manoeuvre the training sessions to fit both. From the Mullinalaghta point of view there was no issue and from the Cavan point of view there was no issue. "We'd have felt coming into the National League it was going to be a big ask for us to compete against the top teams but we were looking forward to it. "The first three games, when we look back on it, we were very competitive and unlucky not to get something out of them."